This is going to drip with geekery, so if you’re not really into these things, you might want to just skip this entry. You have been warned. So I’ve been going through this comic book reawakening lately. I blame the women in in my life: Kate Kane and Diana Prince. Everything was fine until I realized that Batwoman was hitting the comics circuit in such new and exciting ways. And then alternate universe discussions about the possibility of a Wonder Woman movie (if anyone utters the name Megan Fox at this point, I swear I will have you spaced by one of my Internet PersonalitiesTM) combined with the imminent rebooting of Wonder Woman’s comic storyline has inevitably pulled me back in in a huge way. Sitting on my desk right now, in fact, is a stack of Batwoman comics and issues 600 and 601 of Wonder Woman’s comic. Truth is, however, that I’m not much on collecting actual comic books anymore. I haven’t purchased comics on a regular basis since I collected the first three or four issues of the X-Files comics from Topps. Yes, it was that long ago. As much of a collector as I may be, I must draw the line somewhere, and lots of issues of comics are a little more clutter than I’m willing to bear right now. I guess this is why most of my comic books are in a trunk stored at my parents’ house. Therefore, I tend to go for the graphic novels, those glorious compilations of several comics in one handy, pretty book. Like Elegy. Or like the latest graphic novel that I found at the library: Alan Moore’s Whatever Happened to the Man of Tomorrow? I think the one thing that I have taken away from this graphic novel is a final acceptance that I enjoy Alan Moore as a conceptual thinker. But I really don’t enjoy his execution of those concepts. I didn’t come to this realization based on this collection per se, but I think it’s something that I already knew and just needed an excuse to finally accept it as the truth. I guess this book was reason enough to finally embrace what I already knew. Honestly, the stories collected in this novel weren’t all that bad. They weren’t all that great either. Middle of the road is where I would place the Man of Tomorrow. 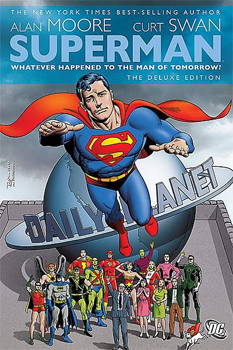 The titular tale is easily the best of the bunch, and deals with some intriguing ideas concerning the Superman story. Is it possible for the indomitable Man of Steel to be stopped, eliminated from existence? Moore posits some interesting takes on these questions. Then comes a story involving Superman and Swamp Thing. I don’t really think anything else need be said about that one. It’s best experienced on one’s own. The final story, “For the Man Who Has Everything,” while not as strong as the eponymous story, is equally intriguing and equally enjoyable. And it features Wonder Woman. A lot. Oh, and Batman and Robin feature prevalently as well. Truth is, I found each of the stories fun to read. They just weren’t…WOW. Apparently, the older I get, the more difficult it becomes to make me say “Wow.” Of course, I’m also the one who thought that a photo of my Wonder Woman and Xena action figures together was cool enough to warrant their own blog post. Go ahead, try to figure me out, denizens. I double dog dare you. If you enjoy Superman as a character, which I generally do even if he isn’t one of my favorite superheroes, then you might enjoy these offerings from Moore. Final Verdict: This book goes back to the library and doesn’t go onto my wishlist.